The WWBPA awards scholarships each year to graduating seniors for their commitment to the community and their efforts to help make the area more bicycle and pedestrian friendly. Click here to view the Scholarship Application, due May 1, 2019. Paul Ligeti and Alice Eltvedt are this year’s winners of the WWBPA’s scholarship to graduating high school seniors. 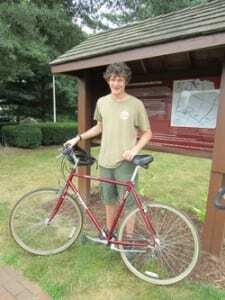 Paul, who graduated from North and is headed to the University of Michigan, impressed us with his Eagle Scout project: an 11-mile bike route of historic West Windsor sites, with a well-researched website that describes the story of each site and red markings at each spot. Paul has led two rides of his route for the WWBPA, and all have been impressed with his work. Alice, who is going to Princeton after graduating from South, led by example as she rode her bicycle to the West Windsor pool. The racks have been overflowing! Kim Meersma, West Windsor-Plainsboro High School South. The 2010 scholarships were awarded in memory of Edward C. Boye, an East Windsor resident who relied on his bicycle for transportation and who was killed by a motorist in February.